As the only open-air pickup in the industry, the Gladiator gives you a variety of ways to bring the beauty of the great outdoors into the interior of this truck. The Gladiator boasts a myriad of exterior color choices, including Hydro Blue, Firecracker Red, Punk'n Metallic, Bright White, and more. The Gladiator has been engineered with adventure in mind. 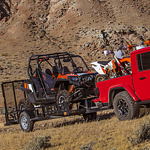 This capable vehicle offers a maximum towing ability of up to 7,650 pounds and a best-in-class payload capacity of up to 1,600 pounds. Regardless of your need, the Gladiator is equipped to handle any challenge on the road of life.